Foods for your Mood Part Three: Purifying Foods! Even our incredible bodies need a little detox assistance sometimes. And feeding your body 'junk' like processed foods and foods high in saturated fat or chemicals, will only put more pressure on your body to speed up the detox systems! Faster! Faster! The more 'junk' that goes in, the more that has to get detoxed out. So why not take a pause, eat good-for-you-foods and let your body get into a deeper state of purification!. Raw Purifying Snacks. Sea Crackers and More. Sea vegetables known as "Brown Algae" have been shown to have purifying properties. Garlic is known as a blood purifier. It has also been said to have powerful detox properties. Garlic is also known as a natural cholesterol lowering supplement. Some raw foodies will actually chew raw garlic as a snack. Long used for its purifying properties, apple cider vinegar is a natural way to purify your body. Bragg's Apple Cider Vinegar has become quite popular in the past decade. Bragg's says the benefits of its apple cider vinegar include: "Rich in enzymes & potassium. Support a healthy immune system. Helps control weight. Promotes digestion & ph Balance. Helps soothe dry throats. Helps remove body sludge toxins" One method is to drink a Tbsp of apc in the morning as a cleansing to your digestive system. Braggs ingredients state: "Certified Bragg Organic Raw Apple Cider Vinegar is unfiltered, unheated, unpasteurized and 5% acidity. Contains the amazing Mother of Vinegar which occurs naturally as strand-like enzymes of connected protein molecules." I am a big fan of spirulina. Read my Spirulina facts post here. Spirulina Blueberry smoothies from Organic Avenue in NYC are soothing and energizing, The sprulina contains many nutrients and can boost nutrition during a detox phase. 5. Raw Fruits and Veggies-High Fiber. Raw fruits and veggies are by far the BEST purifying foods out there. Fiber is incredibly cleansing to you digestive system. Produce that is raw and high in fiber will certainly assist your body in its natural detoxification processes. Examples of fruits and veggies that are high in fiber and nutrients include: spinach, apples, oranges, citrus, carrots, kale, papaya, bananas, pineapple, figs, romaine, watercress, parsley, arugula, blackberries, blueberries and strawberries...just to name a few. I am separating apples as a special purifying food. Apples contain high amounts of pectin and fiber. This is a perfect de-tox combo to digest. Always try to choose organic apples. And always eat the skin-that's where most the vitamins are hiding! Add a sprinkle of cayenne to your juice or smoothie and you will get an instant warming sensation. The spicy kick will jump start your metabolism-even if just a little bit. Stimulating foods and ingredients like ginger, cayenne and pepper are all great for detox and purification. Lemon juice is similar to apple cider vinegar for purification. The acidity helps to purify and cleanse the colon, while the acid helps to break up any food, toxins or nutrients hanging out in your digestive system. Adding a squeeze of lemon to your tea in the morning, or even to a warm glass of water first thing in the morning is a good way to use lemon as a detox aid. And if you are really brave-try a lemon-apple-cayenne-ginger juice first thing in the morning. Super stimulating (and yummy). Another favorite detox food of mine is grapefruit. It's packed with fiber-yes I eat that white stuff just beneath the rind. It's deliciously sweet and tangy. And it has a nice dose of nutrients, especially vitamin c. I adore grapefruit, arugula, fennel salads with a lemon/olive oil vinaigrette. A bit of fresh black pepper on top and I'm set! Whenever you are taking extra steps to detox your body of toxins and sweep away some of that bad bacteria in your colon, you have to remember that the more good bacteria you have the better off you are. I highly recommend finding a really yummy brand of soy yogurt that you like and can get in the habit of eating daily. And if you don't mind spending a few extra bucks, Bio-K Plus is an amazing brand with dairy-free soy yogurt shots. It is the most powerful vegan yogurt shot on the market. I buy mine at Whole Foods. You can also take supplements, but I personally hate popping pills unless its completely necessary. BONUS #11 Raw Foods. Choose raw foods for detox. 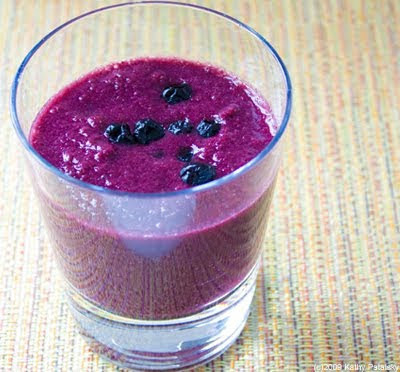 Raw fresh pressed juices and smoothies (like the blueberry-spirulina smoothie pictured above) are fabulous. Choose raw nuts and seeds over roasted. Choose live raw salads instead of cooked veggies. Going raw for a few days will boost the live enzymes in your system, give you a lot of cleansing natural fiber and give you energy. Eating raw foods 100% of the time is incredibly difficult (I certainly could never do it) but for a few days or weeks, it's certainly worth the effort. Those are just a few of my favorite detox foods. Do you have any to add I'd love to hear them! And stay tuned for the last part of the Foods for your Mood Series: Comforting Foods. It will be a comfort-food-fest! All healthy or course. I'm especially excited about my new recipe called "Sweet Potato Tofu Hash". Comfort food indeed!